JoeyBLS Photography is a Northwest Indiana photographer specializing in commercial, aerial, and wedding photography. Are you looking for a photographer in Crown Point, Indiana? I have done many photo shoots in Crown Point, Indiana, most notably on the downtown Crown Point square around the Old Lake County Courthouse. 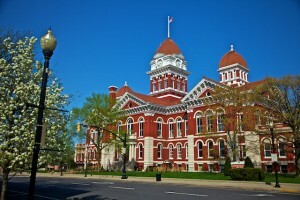 The Old Lake County Courthouse is a great place for wedding photos in Crown Point due to its bright red and white colors that make the courthouse the jewel of the city. Whether you are looking for group photos for your band, engagement photos, event photos, or anything else, contact us and we can let you know our availability. During events such as weddings, receptions, reunions, banquets, etc, I take a photojournalistic approach with my photos, capturing many candid shots and moments as they happen. As a Crown Point photographer, I have archived many photos of Crown Point in and around the square. I have collected many aerial photographs of Crown Point that include the downtown square, the high school, Broadway Ave and the new development in that area, Franciscan St. Anthony’s Hospital, and many other homes and businesses. Click on the links below to view my aerial Crown Point photos. For more information about booking a photographer in Crown Point for your photo needs, please contact me by filling out our contact form and I will get back with you shortly.